Researchers at the University of British Columbia have developed a low-cost, reusable membrane that can be used to separate oil and water on demand and with near-perfect efficiency. The new technology may make processes such as industrial wastewater treatment, oil spill cleanup and fuel purification considerably easier and less costly than before. Composed of an electrochemically treated copper mesh, the “smart membrane” can be switched from oil-removal to water-removal mode simply by applying a few seconds’ worth of voltage from a regular alkaline battery. The highly responsive membrane enables users to achieve almost complete separation of both light and heavy oils from water in a single controlled step. “This technology offers an effective and eco-friendly way to reduce the negative impacts of oily water and wastewater, which are being produced by domestic, municipal and industrial processes every day,” says Chun Haow (Bryan) Kung, a chemical engineering master’s student at UBC who led the study. When a mixture of heavy oil and water is poured onto the membrane, the heavy oil flows through while the water does not (left). When a mixture of light oil and water is poured onto the membrane and a small voltage is applied to the membrane, the water flows through while the light oil does not (right). To restore the membrane to its original state, the membrane is left to air-dry. Oil-contaminated water continues to be a major problem around the world; an estimated two million tonnes of oil are discharged into waterbodies each year. But traditional treatment methods, such as skimming, combustion and solvent extraction, are far from perfect: when they are not expensive or energy-intensive, they are too slow or harmful to the environment to serve as satisfactory long-term solutions. Other separation membranes that can selectively allow either oil or water to pass through them do exist. However, their switching ability is usually conferred by a chemical coating that is not only toxic and short-lasting, but also requires tens of minutes to days to activate and high voltages, corrosive solvents or other unfavorable stimuli or conditions to function. To make matters worse, the separation that is achieved is not particularly good, producing oil and water of relatively low purity. In contrast, the UBC team’s membrane is free of additives and capable of separating water from oils of various densities and viscosities with more than 98 per cent efficiency. By applying just a small electrical potential, one can change the membrane from being super oil-loving and water-resistant (enabling only oil to pass through) to super water-loving and oil-resistant (enabling only water to pass through) in just a few seconds. As the membrane air-dries, it returns to its original state. What’s more, preparing the membrane is a quick, scalable process involving widely available copper materials: a copper mesh is immersed in an electrolyte solution and subjected to a succession of two small voltages for a total of two minutes. The “tunable wettability” of the resulting membrane may be attributed to the multiscale roughness of the mesh structure and the copper oxides that are bound to it, which transform into water-loving metallic copper when voltage is applied. The technology was recently described in Applied Surface Science. 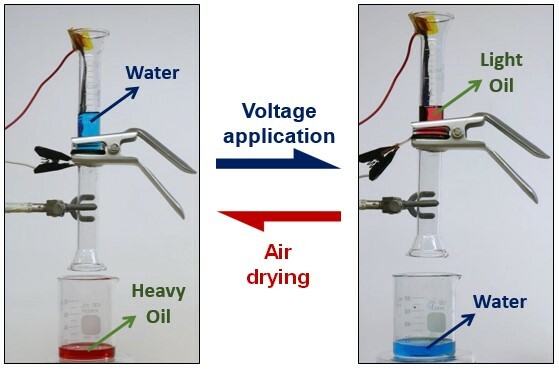 Titled “On-demand oil-water separation via low-voltage wettability switching of core-shell structures on copper substrates,” the paper was co-authored by Kung, Beniamin Zahiri, Pradeep Kumar Sow and Mérida.